I can't believe how early our spring flowers are blooming! 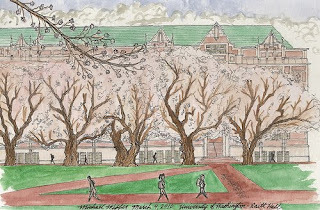 I sketched some of the Quad cherry trees at the UW today. The building in the background is Raitt Hall. great sketch of a magnificent scene! Nice! I like how you captured the density of the blossoms. I heard just yesterday that they are blooming and I'm headed there today!